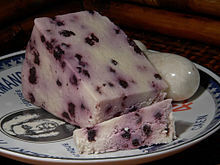 Stilton is an English cheese, produced in two varieties: Blue, known for its characteristic strong smell and taste, and the lesser-known White. Both have been granted the status of a protected designation of origin by the European Commission, which requires that only cheese produced in the three counties of Derbyshire, Leicestershire and Nottinghamshire and made according to a strict code may be called "Stilton". Thus cheese made in the village of Stilton which is now in Cambridgeshire (from where its name was derived in the 18th century) could not be sold as "Stilton". Frances Pawlett (or Paulet), a "skilled cheese maker" of Wymondham, Leicestershire, has traditionally been credited as the person who set modern Stilton cheese's shape and style characteristics in the 1720s, but others have also been named. A recipe for a Stilton cheese was published in 1721 by Richard Bradley, later first Professor of Botany at Cambridge University. Another early printed reference to Stilton cheese appeared in William Stukeley's Itinerarium Curiosum, Letter V, dated October 1722. Daniel Defoe in his 1724 work A tour thro' the whole island of Great Britain notes, "We pass'd Stilton, a town famous for cheese, which is call'd our English Parmesan, and is brought to table with the mites, or maggots round it, so thick, that they bring a spoon with them for you to eat the mites with, as you do the cheese." According to the Stilton Cheesemaker's Association, the first person to market Blue Stilton cheese was Cooper Thornhill, owner of the Bell Inn on the Great North Road, in the village of Stilton, Huntingdonshire, (now an administrative district of Cambridgeshire). Traditional legend has it that in 1730, Thornhill discovered a distinctive blue cheese while visiting a small farm near Melton Mowbray in rural Leicestershire – possibly in Wymondham. He fell in love with the cheese and made a business arrangement that granted the Bell Inn exclusive marketing rights to Blue Stilton. Soon thereafter, wagon-loads of cheese were being delivered to the inn. Since a main stagecoach route from London to Northern England, the Great North Road, passed through the village of Stilton he was able to promote the sale of this cheese and the fame of Stilton rapidly spread. In 1936 the Stilton Cheesemakers' Association (SCMA) was formed to lobby for regulation to protect the quality and origin of the cheese, and in 1966 Stilton was granted legal protection via a certification trade mark, the only British cheese to have received this status. Blue Stilton's distinctive blue veins are created by piercing the crust of the cheese with stainless steel needles, allowing air into the core. The manufacturing and ripening process takes approximately nine to twelve weeks. For cheese to use the name "Stilton", it must be made in one of the three counties of Derbyshire, Leicestershire and Nottinghamshire, and must use pasteurised local milk. The manufacturers of Stilton cheese in these counties applied for and received Protected Geographical Status (PDO) in 1996. As of September 2016[update] just six dairies are licensed to make Stilton (three in Leicestershire, two in Nottinghamshire and one in Derbyshire), each being subject to regular audit by an independent inspection agency accredited to European Standard EN 45011. Four of the licensed dairies are based in the Vale of Belvoir, which straddles the Nottinghamshire-Leicestershire border. This area is commonly regarded as the heartland of Stilton production, with dairies located in the town of Melton Mowbray (Leics.) and the villages of Colston Bassett (Notts. ), Cropwell Bishop (Notts. ), Long Clawson (Leics.) and Saxelbye (Leics.). Another Leicestershire dairy was located in the grounds of Quenby Hall near the village of Hungarton, which is outside the generally accepted boundaries of the Vale of Belvoir. Quenby Hall restarted Stilton production in a new dairy in August 2005 (the old dairy dates back to the 18th century) but the business folded in 2011. The former Dairy Crest-owned licensed dairy that produced Stilton at Hartington in Derbyshire was acquired by the Long Clawson dairy in 2008 and closed in 2009, with production transferred to Leicestershire. Two former employees set up the Hartington Creamery at Pikehall in Hartington parish which was licensed in 2014. Stilton cheese cannot be produced in the village that gave the cheese its name. Stilton village is not in the three permitted counties; it is in the administrative county of Cambridgeshire, and in the historic county of Huntingdonshire. The Original Cheese Company applied to Defra to amend the Stilton PDO to include the village but the application was rejected in 2013. Stilton cheese was also manufactured in Staffordshire. 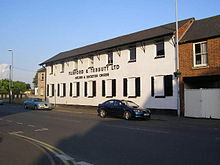 The Nuttall family of Beeby, Leicestershire opened a Stilton cheese factory in Uttoxeter in 1892 to take advantage of the local milk and good transport links. However, this enterprise did not last long and the site became a general dairy. Stilton has a typical fat content of approximately 35%, and protein content of approximately 23%. A number of blue cheeses are made in a similar way to Blue Stilton. These cheeses get their blue veins and distinct flavour from the use of one or more saprotrophic fungi such as Penicillium roqueforti and Penicillium glaucum. Stichelton is made in the same way as Stilton cheese and uses cows' milk from a permitted county (Nottinghamshire), but the milk is unpasteurised and so under the PDO it cannot be designated as true Stilton. Since the PDO came into effect, some British supermarkets have stocked a generic "British Blue cheese". Other makers have adopted their own names and styles. Other examples of blue cheeses include Gorgonzola cheese of Italy, which is made from cows' milk; and the French cheeses Fourme d'Ambert from Auvergne and made with cows' milk and Roquefort, which is made with ewes' milk. Blue Stilton is often eaten with celery or pears. It is also commonly added as a flavouring to vegetable soup, most notably to cream of celery or broccoli. Alternatively it is eaten with various crackers, biscuits and bread. It can also be used to make a blue cheese sauce to be served drizzled over a steak, or can be crumbled over a salad. Traditionally, a barley wine or port are paired with Blue Stilton, but it also goes well with sweet sherry or Madeira wine. The "uncouth" practice of scooping a hollow into the centre of a Stilton cheese and pouring the port wine into it is deprecated; nonetheless this combination has been marketed in screw-topped tubes, "like toothpaste". The cheese is traditionally eaten at Christmas. The rind of the cheese forms naturally during the aging process, and is perfectly edible, unlike the rind of some other cheeses such as Edam or Port-Salut. White Stilton has not had the Penicillium roqueforti mould introduced into it which would otherwise lead to the blue veining normally associated with Stilton. It is a crumbly, creamy, open textured cheese and is now extensively used as a base for blending with apricot, ginger and citrus or vine fruits to create unique dessert cheeses and has even been used as a flavouring for chocolate. The Long Clawson Dairy has created a very expensive variety White Stilton Gold, made with edible gold leaf and gold-Cinnamon Schnapps. Huntsman cheese is made with both Blue Stilton and Double Gloucester. A 2005 survey by the British Cheese Board reported that Stilton seemed to cause unusual dreams, with 75% of men and 85% of women experiencing "odd and vivid" dreams after eating a 20-gram serving of the cheese half an hour prior to sleeping. This is in part a parody of William Wordsworth's sonnet "London, 1802", the opening line of which was "Milton! thou shouldst be living at this hour." George Orwell wrote an essay, "In Defence of English Cooking", first published in the Evening Standard on 15 December 1945. While enumerating the high points of British cuisine, he touches on Stilton: "Then there are the English cheeses. There are not many of them but I fancy that Stilton is the best cheese of its type in the world, with Wensleydale not far behind." The Stilton Cheese Makers Association produced a fragrance called Eau de Stilton which was "very different to the very sweet perfumes you smell wafting down the street as someone walks past you." The search for an unpasteurised Stilton cheese was a plot element of a Chef! episode entitled "The Big Cheese", aired on BBC1 on 25 February 1993. A character named G. D'Arcy "Stilton" Cheesewright appears in several of the Jeeves novels of P. G. Wodehouse. ^ "Denomination Information White Stilton cheese ; Blue Stilton cheese". OJEU. Retrieved 4 June 2014. ^ Linford, Jenny (2008-10-20). Great British Cheeses. Penguin. pp. 208–. ISBN 978-0-7566-5100-8. Retrieved 11 March 2013. ^ Weinzweig, Ari (2003-11-14). Zingerman's Guide to Good Eating: How to Choose the Best Bread, Cheeses, Olive Oil, Pasta, Chocolate, and Much More. Houghton Mifflin Harcourt. pp. 286–. ISBN 978-0-547-34811-7. Retrieved 10 March 2013. ^ McCartney, Stewart (2012-04-30). Popular Errors Explained. Random House. pp. 36–. ISBN 978-1-4090-2189-6. Retrieved 10 March 2013. ^ Everyman's Library (London/New York: Dent/Dutton, 1928), Vol. II, p. 110. ^ a b "Stilton Cheese: History of Stilton". stiltoncheese.com. ^ Edwards, Adam (20 June 2006). "The cheese that broke the mould". London: Daily Telegraph. Retrieved 2010-05-24. ^ "Stilton Cheese – The Stilton Producers". stiltoncheese.co.uk. Iconography Ltd.
^ "Quenby Hall administrators seek buyer". meltontimes.co.uk. 22 April 2011. Retrieved 22 February 2018. ^ "Say cheese! Derbyshire Stilton on sale for first time in five years". Derby Telegraph. 5 September 2014. Archived from the original on 4 June 2015. Retrieved 22 February 2018. ^ Charles, Aaron-Spencer (December 28, 2011). "Cheese made in Stilton not allowed to be called Stilton – it's the law". Retrieved December 28, 2011. ^ Richards, Chris (23 October 2013). "Villagers' bid to make Stilton cheese in Stilton is rejected". Daily Mirror. Archived from the original on 16 July 2014. Retrieved 22 February 2018. ^ a b Trott, Robert E (12 January 1994). "Product Specification". Agricultural and Rural Development DOOR. European Commission. Retrieved 24 January 2016. ^ "Broccoli & Stilton Soup recipe". The Accidental Smallholder. ^ Rubino, G (1991). "The Mediterranean Way of Eating". Rotunda. Vol. 24 no. 3. Royal Ontario Museum. p. 11. ^ Layton, T. A. (1973). The cheese handbook; a guide to the world's best cheeses, over 250 varieties described, with recipes. New York: Dover Publications. pp. 116–7. ISBN 9780486229553. ^ "Food – Christmas". BBC. ^ "Chocolate cheese hits the shelves". Which? magazine. April 5, 2007. ^ Roberts, Brian (18 February 2018). "These Are The 3 Most Expensive Cheeses In The World". Forbes. Retrieved 14 February 2019. ^ "Sweet Dreams Are Made of Cheese". 2005-09-25. Archived from the original on 2006-01-15. Retrieved 2007-07-20. ^ "Stilton scent pleases cheese fans". news.bbc.co.uk. 12 May 2006. Wikimedia Commons has media related to Stilton cheese. This page was last edited on 19 March 2019, at 01:38 (UTC).